In college I was known for working hard AND playing hard and not much has changed. Ok, I'll face it. Everything as changed. But I still like to play. Hard. Lovely 4 hour drive. We talk, talk, talk, and talk some more. And then continue talking all weekend. Triathlon girl talk and triathlon mom talk for hours. Leslie has been in the sport for about as long as I have - 10+ years - is married and has 3 kids. As you can imagine, there is lots to talk about. Loved it. We arrived just in time to hit the Chuckawalla trails in the fading sunlight. I was (almost) wishing I had come to rock climb there but the trails are super fun as well. We had a great view and then ... we got lost. Very lost. My fault. 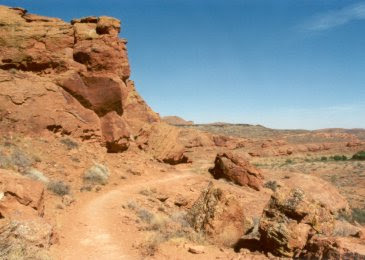 I claimed to know the trails but did not pay attention due to all the talking. Oops. Still made it back before dark and in reasonable time. We sped up quite a bit on the last 2 miles after realizing that we (and by 'we' I mean 'I') forgot to lock up our bikes. Two brand new triathlon bikes. Oops again. Maybe I should stop talking and start thinking. We stayed with Leslie's wonderful friend Sylvia and her family in their beautiful home. So much easier and more comfortable than camping. We went on a lovely 92 mile bike ride! That is 150 km, in case you were wondering.And I can honestly say that I enjoyed every (hard) mile of it. We got a bit of a late start because ... well ... just because. No reason to get up at 5 and squeeze in a work out before the kids wake up. We had all day to play. It was beautiful outside but the howling of the wind all night had us a little worried. And as soon as we left the garage it hit us hard and never let up. For 6 long hours. So instead of cruising along down on our aero bars, we had to hammer away even on most of the downhills. Fun times. Although this was only my 2nd ride outside since November and I had not ridden more than 2 hours on my trainer, I felt great! 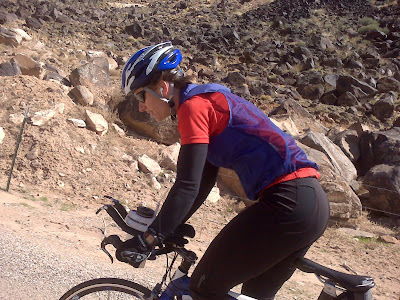 I was just so happy to be on my bike, feel the wind in my face and the sun in my back that I could not get enough! Until I jumped off my bike and into my running shoes. Running definitely did not feel so good, but it was only 1o minutes. I can do anything for 10 minutes :-) Especially knowing that recovery is right around the corner. Usually there is no time for recovery, so this was a treat: recovery drink, elevate legs, warm shower, ice bath, compression socks, and good food. I felt better than I do after a day of chasing kids around. My first ice bath. Loved it. Highly recommend it. 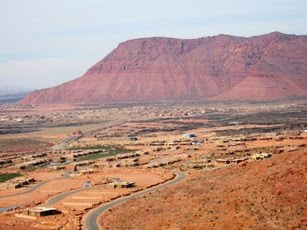 Leslie, who is doing Ironman St. George in May, needed to run 20 miles on the IM course. Knowing that my legs don't like asphalt for very long, I joined her for the last 13 miles. I can't say that I enjoyed it as much as the bike ride but it was still good times. It is always fun to see what your body can handle. So glad you had a great time!! And, as always, it blows me away at how much you do! I'm jealous! I would love to do a training vacation...but maybe not with you because you are CRAZY!!! You constantly amaze me with how hard you push yourself. It's inspiring, really. Also, it cracks me up that you took a picture of the two of you in the bath tub! I remember doing ice baths back in my track days...when I USED to be an athlete. ha!